On this date in 1571 in Bordeaux, France, a nobleman named Michel de Montaigne sat down to write. It was his 38th birthday, and he had just retired from public life where he held a seat in the Bordeaux parliament. What Montaigne wrote that day and what he would write for the next twenty years influenced countless future writers of prose. 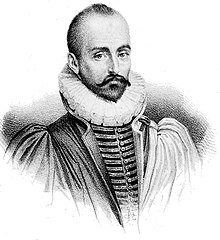 Montaigne wrote essays, but he wasn’t just writing essays, he was inventing the genre. He called his compositions “essais” from the French verb “essayer” meaning “to try.” An essai, therefore, is an “attempt” or a “trial” where the writer attempts to address a question and figure it out (1). Unlike the concept we have today of beginning an essay with a thesis – a statement of belief – the original idea of the essay was instead to begin with a question. The attempt to answer this question in writing then becomes the process by which a writer explores his or her thinking, getting ideas down on paper so that they can be examined. The act of writing, then, becomes the act of forming ideas and the exploring those ideas so that the writer knows what he or she really thinks. In this sense the essay becomes a form of metacognition, or thinking about your own thinking. The abstract thoughts of a writer are transformed into visible words on paper. This allows writers to see what they know and what they don’t know. By further rumination, examination, and revision of those thoughts, they can crystallize their thoughts, making them more clear to themselves and to an audience. Montaigne’s essay were intensely personal. He wrote about sleep, smells, idleness, anger, repentance, and thumbs, but his main subject was always himself. By expressing and exploring ideas about himself in writing, he discovered that he not only understood himself better, but also understood his own thoughts and his own thoughts about the world. Montaigne reminds us of the power of writing not just as a way of expressing what we know, but also of discovering what we know by getting our thinking down on paper. When we write, therefore, we aren’t just learning how to write, we are writing to learn. What is a question that you have about some aspect of universal human experience, such as anger, happiness, love, lying, or marriage? Select a universal human theme and form a question about that theme that you do not have a definitive answer to. Explore that question in a personal essay by writing about different ways the question might be answered and by answering it based on your own memory, observations, and experiences. Don’t commit yourself to supporting a single thesis; instead, try to truly explore your own ideas in writing to see what new thinking emerges. On this 26th day of the second month it makes sense to use the most fundamental tool of literacy, the 26 letters of the alphabet, to create the most fundamental construction of English syntax, the two-word kernel sentence. As King confirms the essential core elements of each English sentence is its kernel – the subject-noun and predicate-verb. Verbal Irony: A type of figurative language where someone intentionally says one thing while meaning another thing, usually the exact opposite. This usually involves the use of overstatement or understatement, as in “I can’t wait to get home and get to work on my 10 hours of homework” or “Yeah, Michael Jordan is pretty good basketball player.” One specific subclass of verbal irony is sarcasm, which is irony that is used to insult or to cause harm. Situational Irony: Irony that involves a situation in which actions have an effect that is opposite from what was intended or when there is a discrepancy between what is expected to happen and what actually happens. For example, rain on your wedding day is not ironic but a fire station that burns down is. Dramatic Irony: This type of irony occurs in fiction and involves events in a story where the audience is aware of something that the characters in the story are not. For example, in Romeo and Juliet this occurs when Juliet’s father and mother are planning her wedding to Paris. The audience knows that Juliet is already married to Romeo, but the Capulets are clueless. Based on these definitions we can conclude that the only thing ironic about Morissette’s song is that a song that is entitled “Ironic” contains nothing ironic. 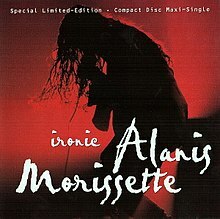 Probably the best thing about Morissette’s song is that it spawned a website devoted entirely to the topic of irony called IsItIronic.com. Founded by Paul Lowton in 2006, the mission of IsItIronic.com is to provide a writer’s resource for definitions and examples of irony. At the site, readers can submit their own questions, such as “Is it ironic that there was a hotdog eating contest to raise money for obesity awareness?” Readers at the website are also invited to calibrate their own sense of true irony by voting on the questions submitted. What is a story you have heard or a personal experience you have had that involves real irony? Tell a story that contains one of the three forms of irony. It may be a true story based on your experiences, a story you have heard second hand, or a fictional anecdote you create. On this date in 1820, Felix Walker, a congressman representing Buncombe County, North Carolina, delivered a speech that eventually lead to the creation of a new English word. Later in 1923, novelist and biographer William E. Woodward wrote a novel called Bunk. In the novel, Woodward introduced the verb debunk, meaning “the act of exposing false claims” (2). What is a statement made by some people that you think is not true? How would you go about debunking this myth? Identify a statement that people sometimes make as if it is absolute truth, such as the examples below of statements that people make about language. Research the issue, and then write a paragraph explaining why specifically that statement is not true. Cite your sources. -A word is only a word if it is in the dictionary. -Lexicographers make up the words that go in the dictionary. -English is the official language of the United States. -The meanings of words always remains the same. -Slang is ruining the English language. -There is only one English language. -You should never end a sentence with a preposition. 1-Chrysti the Wordsmith. Verbivore’s Feast Second Course. Helena, Montana, Farcountry Press, 2006: 43. 2- Dickson, Paul Authorisms: Words Wrought by Writers. New York: Bloomsbury, 2014: 53. That brief conversation in a bar in 2002 began Whitman’s quest for other Two Things from other fields, such as philosophy, marketing, finance, and computer science. The idea behind the Two Things game is to distill and to simplify. To do this experts must re-examine what they know and go back to basics. This helps them see their field with new eyes. Experts within a single field seldom agree on their Two Things; nevertheless, what they come up with is always interesting and illuminating, both to insiders and to outsiders. Find out who is buying your product. Find more buyers like them. 90% is just showing up (borrowed from Woody Allen’s philosophy of life). When you are winning, keep your mouth shut. Neurons strengthen or weaken signal strength between connected synapses. If you think you’ve found the part of the brain that controls _________, you’re probably wrong. On this date in 1978, two songs tied for Song of the Year at the 20th Annual Grammy Awards held in Los Angeles. The two songs were Barbra Streisand’s “Evergreen” (Love Theme from A Star Is Born) and Debby Boone’s “You Light Up My Life.” It was the first time in Grammy history that there was a tie for Song of the Year. Today neither song has stood the test of time as a quality song. The best choice in retrospect would have been the Eagles “Hotel California,” which also nominated and which still receives airplay today. Fans of the Eagles will find solace, however, in the fact that “Hotel California” did win the Grammy for Record of the Year (1). This brings up the questions of the semantic difference between Record of the Year and Song of the Year. Record of the Year recognizes an artist’s performance of a song along with the song’s producers; Song of the Year is an award given to the writer or writers of a song. Today is the birthday of American psychologist Benjamin Bloom who was born in 1913. In 1956 Bloom created what has become the most influential model of how people learn and how people think. Bloom’s Taxonomy of Educational Objectives, which was created over sixty years ago, remains one of the most useful tools for teachers and students to articulate the ways in which the brain processes learning, beginning with foundational learning and moving to higher levels of critical thinking. The idea behind Bloom’s Taxonomy is to help teachers and students advance their thinking and learning beyond superficial levels. By classifying thinking into six categories, the model makes the thinking and learning process less abstract, showing how students can process their learning in different ways and at different levels. Knowledge – Remember: This is the most fundamental level of learning something. It is the recall level where students memorize a fact, a definition, or a concept. If, for example, you were studying the concept of cognitive dissonance, you might write down and memorize the definition. Comprehension – Understand: This is where students move beyond just memorization by explaining what they know in their own words, by summarizing main ideas, and by illustrating what they know with examples. This also involves comparing, contrasting, classifying, inferring, and predicting. Engaging with the learning in this way, moves the learning from short term memory to long term memory, making it more likely that the learner will be able to master what they are learning. If, for example, you were studying cognitive dissonance, you might demonstrate your understanding of the term by explaining what cognitive dissonance is in your own words and by giving a specific example to illustrate it. Application – Apply: This where students use what they have learned by applying it to a new situation or context. Using the knowledge takes it from the theoretical level to the practical application level, making the learning both more meaningful. If, for example, you were studying cognitive dissonance, you might apply your knowledge of it by explaining how cognitive dissonance might relate to a situation in which a person buys a new car. Analysis – Analyze: This is where students examine and break information into parts or classifications. It involves looking at causes and effects, making inferences, and supporting generalizations with evidence. If, for example, you were studying cognitive dissonance, you might analyse it by identifying the specific causes and effects that make it happen. Evaluation – Evaluate: This is where students form and defend opinions about what they are learning. It involves making judgements based on criteria and supporting those judgements with valid evidence. If, for example, you were studying cognitive dissonance, you might evaluate it by discussing whether or not the overall effects of cognitive dissonance on individuals is positive or negative. Synthesis – Create: This is where students use their knowledge and learning to create something new and original. It involves combining elements into new patterns or generating alternative ideas or solutions. For example, if you were studying cognitive dissonance, you might write a research report on the term where you use evidence from two or three difference sources to explain your position on why it is an important concept. You might also develop your own graphic to illustrate the cause and effect relationships related to the idea. Notice that each of the six different levels of the taxonomy requires the learner to engage at deeper and deeper levels with the learning, integrating that knowledge in different ways, ways that are successively more challenging, ways that require more and more cognitive engagement which then leads to higher order thinking and higher levels of mastery. On this date in 1943, American artist Norman Rockwell published the first of his four prints depicting “The Four Freedoms.” The prints were designed to illustrate “The Four Freedoms” that President Franklin D. Roosevelt articulated in his January 6, 1941 State of the Union address: freedom of speech, freedom of worship, freedom from want, and freedom from fear. When Japan attacked Pearl Harbor on December 7, 1941, 12 months after Roosevelt’s Four Freedoms speech, the United States ended its isolationism and entered the war. After hearing Roosevelt’s speech and after the attack on Pearl Harbor, Norman Rockwell was inspired to do his part by trying to capture and illustrate the abstract ideas of the Four Freedoms in concrete, human terms. The first print, for example, depicts a scene of a local town meeting where a man wearing a plaid shirt and suede jacket stands among his fellow citizens to express his position. Rockwell based the scene on an actual town meeting that he had attended where citizens gathered to discuss plans to build a new school in their town. At the meeting, a lone dissenter named Jim Edgerton, a young blue-collar worker, stood to voice his opposition. Rockwell remembered the scene vividly because although no one at the meeting agreed with Edgerton, they still listened to him respectfully. Each of Rockwell’s four prints appeared in the weekly magazine The Saturday Evening Post. The prints proved so popular that the United States Department of the Treasury used them to promote the sale of war bonds. The Four Freedoms Tour, which displayed the paintings around the country, raised over $130,000,000 (2). Today is the birthday of Nicolaus Copernicus, a man who not only changed the world as we know it, but also the universe. Born in Poland in 1473, Copernicus was both a polyglot and a polymath. He spoke Latin, German, Polish, Greek, and Italian. In addition to holding a doctorate in canon law, he was also a physician, mathematician, classics scholar, translator, governor, diplomat, and economist. Today, we know him best as the astronomer who challenged the orthodox belief that Earth was the center of the universe. Fifteen-hundred years after the ancient Greek astronomer Ptolemy established his theory that the planets, the sun, and the stars revolved around a stationary Earth, Copernicus presented his revolutionary theory. He claimed that not only did the Earth rotate on its axis, but also that Earth and the other planets revolved around the sun. Copernicus’ work in astronomy was the quintessential achievement of the Renaissance, totally transforming mankind’s view of the universe and paving the way for future work by Galileo, Kepler, and Newton. 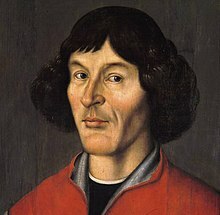 A true man of science and of learning, Copernicus embodied the Renaissance ideals of searching for knowledge and challenging conventional wisdom. His opus On the Revolution of the Celestial Spheres was published in 1543, the same year he died (1). Today cognitive psychologists sum up Copernicus’ insight using a single term: metacognition. Meta is Greek for “about,” and cognition is Latin for “to know.” Metacognition, therefore, is “thinking about thinking.” More than just being aware that we think, metacognition is the process of monitoring our own thinking. As Copernicus reminds us, metacognition is not just what we know, it is also being aware of what we don’t know, as well as being aware of the ways we sometimes delude ourselves. To understand the ways we think best and the ways we fall short of sound thinking, we should always keep in mind the relationship between both knowledge and ignorance. In the book Make It Stick, the authors discuss one specific learning strategy that employs metacognition to help learners be more productive and more efficient in their study. The strategy is called retrieval practice, and recent studies have documented that this strategy is much more effective than rereading a text, highlighting a text, or even reviewing notes. The key aspect of retrieval practice is self-quizzing or testing. When reading a text or listening to a lecture, therefore, the student should generate questions for self-testing. Once the student has finished reading or listening, he or she should use the questions to recall and recite out loud the facts, concepts, or events from memory, without using the book or notes for reference. The basic premise of retrieval practice is that learning that sticks is learning that is effortful. Furthermore, the effortful act of retrieving knowledge from memory strengthens the memory, increasing the likelihood that knowledge will stay in long term memory. Like walking an unfamiliar path through the woods, the more you travel the path, the more confidence you have in remembering your way without getting lost. Retrieval practice also decreases the likelihood that students will delude themselves into believing they know what they don’t know. Since the strategy requires that student recite answers aloud, they are able to exercise good metacognition by clearly determining what they know and what they don’t quite know yet (2). Today’s Challenge: What Do You Know? 2-Brown, Peter C., Henry L. Roediger III, Mark A. McDaniel. Make It Stick: The Science of Successful Learning. Cambridge, Mass. : Harvard University Press, 2014.